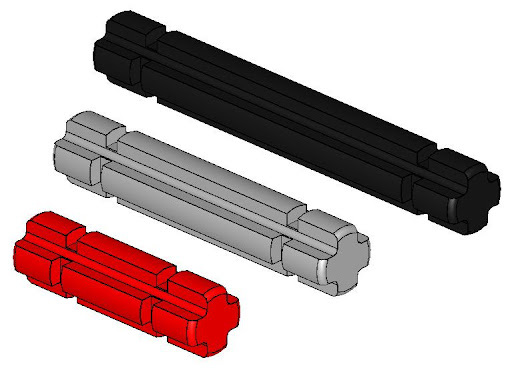 TechnicBRICKs: TBs TechTips 24 - Tired to hurt your fingers? It happened to me while disassembling old TECHNIC sets, kept assembled for years, which used that old friction pins (without center slots) where the grip was much stronger. While exchanging some messages about parts redesign ideas, with a Dutch AFOL, it came to my attention a tool that may help with it. 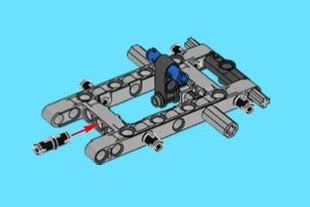 It is a tool designed by Martijn Bosgraaf (Dryw Filtiarn) who also runs a blog dedicated to his LEGO work. But found the above tool had not enough grip to pull out a 4L axle. The new light gray 3L and 5L axles have slightly less friction than the black ones, so they should come out easier. Bellow a typical situation, taking the new 8263 B-model (Arctic Tracker) instructions as an example, where two axles (3L) in the right end of the frame, may cause some trouble. This become more and more a problem as the axle length increases. Fortunately the longer axles are also less likely to be found in such problematic utilization. I'd say this can be a likely situation for 2, 3, 4 and probably 5L axles. However it is a very handy tool, to assist you with a large amount of pins to extract. Alternatively I would find it nice, if TLG part designers would consider to modify at least the shorter axles (up to 5L) to make them 'notched', as they did it the 2L axle already some years ago. Thanks 'Bar Man', for rendering the proposed axles. I use needle nosed pliers. When used properly, you will never damage a LEGO piece. For pins and such, don't clamp down on the entire pin, rather grip one of the "flanges" with the pliers. For axles, grab in the 'wedges' of the axle.